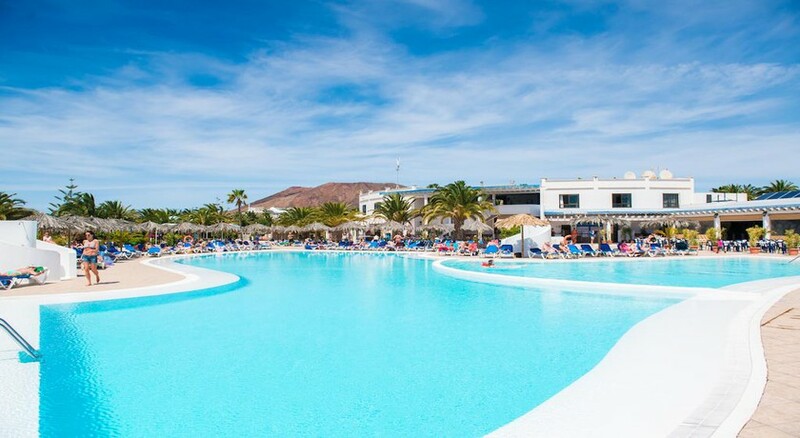 The 4-star Hotel HL Río Playa Blanca enjoys a fabulous location on the south of Lanzarote in the seaside resort of Playa Blanca, affording great views of Fuerteventura and Lobos Islands. Guests can find an ideal family friendly beach a mere 300m from the hotel as well as the resort centre, where the guests will find a fine array of shops, cafes, lively bars, restaurants and nightly entertainment. The hotel offers several facilities and services that the entire family can enjoy. This ultimately makes Hotel HL Rio Playa Blanca an ideal location for a relaxing family fun holiday in the sun. For a fabulous beach day out take a trip to the White Beach, which is awarded the European Blue Flag for cleanliness with a promenade awash with great cafes, bars and restaurants making it an ideal choice for the whole day. Nestled in Playa Blanca in the southern part of Lanzarote, Spain. 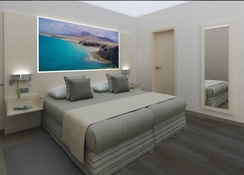 The Hotel HL Rio Playa Blanca offers beautiful views of the islands of Lobos and Fuerteventura. The lively Flamingo beach is 1.4km from the complex, where guests have access to local activities, including water sports and hiking. The Timanfaya National Park is about 20km. The Lanzarote Airport is approximately 28km from the resort. The hotel offers guestrooms in one category – suites. Each bungalow here is air-conditioned and has a lounge, fully-equipped kitchen, bathroom and terrace. Amenities include hairdryer, satellite TV, minibar, in-room safe, sofa-beds and refrigerators. The Hotel HL Rio Playa Blanca offers a unique dining experience thanks to its terrace restaurant. It provides personalised attention, special dishes from across the world, conventional recipes, varied appetizers, tapas, special food options for vegetarians, live cooking sessions and use of the most delectable locally sourced ingredients. If you want to have coffee and refreshing drinks, then the pool bar is the right place to hit. The sports and entertainment facilities are aplenty in the hotel, making everyone happy and relaxed. Some of the sports facilities in the hotel include tennis courts, playground, water park, two outdoor swimming pools. 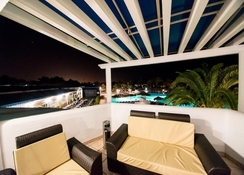 Guests can make themselves comfortable at the solarium terrace that comprises comfortable sun beds and umbrellas. Or get a relaxing massage at the spa to lose yourself in your own world. While the parents are busy in the spa the kids can take advantage of the entertainment programme, which is specifically designed for children. Due to the renovation work, that is currently taking place in the hotel, the hotel has decided to offer these guests an alternative inside the same chain so that this does not affect these guests during stay. great value for money, the hotel does have its flaws and we did find the area slightly boring but we had a great time! A lovely post christmas stay in the sunshine. 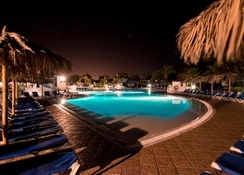 I stayed at the HI Rio Playa Blanca Hotel in early January staying for a week. We were all inclusive and I stayed with my adult nephew. The hotel is actually a complex of individual bungalows surrounding a central pool area, restaurant, entertainment suite. We thoroughly enjoyed our stay. the bungalows were lovely with lots of room and own private veranda very clean and had all you needed. The food was extremely plentiful and tasty ( I am vegan and still had oddles of choice). The staff were really friendly, the pools large and clean. The hotel is about ten minute walk form the beach and shops restaurants at flamingo beach. Whilst the hotel is not "high end" it is really nice with a lovely atmosphere, great location and the bungalows are like a home form home but with sunshine. We will both certainly stay again. Stayed here in January for a week, accommodation very spacious and clean, food good albeit a little repetitive, not much in the way of entertainment but quiet time of year. . Heard the hotel is due to close this year for refurbishment so once done will be fabulous. Excellent comfortable stay in pleasant surroundings. Very nice complex, verdant and spacious, private bungalows. Decent food, a nice pool with plenty of space and a decent pool bar. All in all very good value for money, esp with shared waterpark of sister hotel and regulations bus to beach. 2nd time being to these apartments and had one of the new ones. 2 showers was great as usually can’t get my 5yo son out of shower, didn’t matter as we could use the other. Never go hungry as plenty to eat. Staff were great. Lovely secluded suite but still good access to pool, restaurant etc. Hard working entertainment team and staff generally. Not really 4* eating. Nice roomy accommodation with good poolside area and facilities. Best variety of tasty food I have experienced with all inclusive holidays.